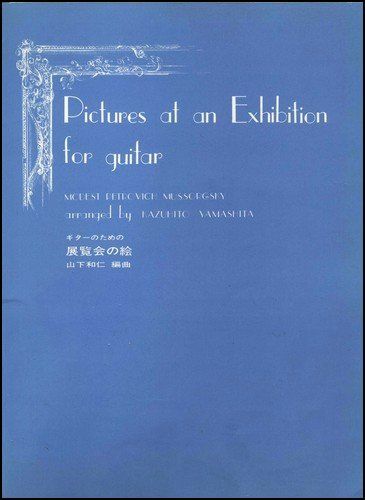 MUSSORGSKY, PICTURES AT AN EXHIBITION FOR GUITAR. Kazuhito Yamashita. Magistrale trascrizione per chitarra di una delle composizioni più note della musica classica. Come registrato nel disco dal fenomeno della chitarra, Kazuhito Yamashita. Grandioso! Promenade -gnomus -promenade -Il vecchio castello -the tuileries -bydlo -promenade -ballet of the little chickens -Samuel Goldenberg und Schmuyle -a market place in Limonges -catacombae -the hut of baba-yaga -the bohatyr gate of Kiev. 1961 Born in Nagasaki. Has been studying the guitar under his father(Toru Yamashita). 1972 Won first prize at the 18th Kyushu Guitar Music Concours. 1976 Won first prize at the 19th Guitar Concours organized by the Federation of Japan Guitar Association. 1977 Visited Europe. Participated in the Guitar Course of Segovia in the 20th "Musica en Compostela". Won first prize at the Ramirez Guitar Competition in Spain: at the 10th Alessandria International Guitar Competitionin Italy: and at the 19th International Guitar Coneours in Paris. 1979 10.Recitals in Paris and Amsterdam. 1980 l1.Concert tour in Holland. 1981 Arranged "Pictures at an Exhibition", and recorded it.His arrangement caused a sensation. 1982 l1.Concert tour in Holland. "Modern Collection"(disk) won a prize at the Record Academy. 1983. Concert tour in Korea. 1984 5.Played in concert with Wolfgang Shultz(a chief flutist of the Viena Philharmonic Orchestra). 8~9.Played in concert with Larry CoryellUazz guitarist). 9 .Played concert in Korea . 11.Played concert with Chamber Orchestra of LeoS Jan:1Cek Ostrava. 1985 1 .Played consert in Taiwan. 3 .Gave the first performance of guitar concerto "Pegasus Efect" composed by Takashi Yoshimatsu . Kojiro Kobune, J.Thomas, N.Yepes, Andres Segovia, Toru takemitsu. Presently, the first guitarist of the Nagasaki Guitar Ensemble. Belongs to the Nagasaki Guitar Academy. 1981.3 .10 and 11. Recording at the Iruma Municipal Hall. 1981.6 .21. Publication of the record and musical score. 1983. Won the Deutscher Schallplattenpreis. What is undoubtedly the most famous and most acclaimed guitar concerto ever written is now a fabulous MMO release! The recently deceased Joaquin Rodrigo, foremost proponent of the classical guitar in the concert literature, wrote this masterpiece of 20th-century music in 1939. Gorgeous and eternally popular, it is an indispensable component of any guitarist’s library. This deluxe 2CD set includes a slow-tempo practice version to help you get up to speed. Includes a high-quality printed solo part annotated with track-break indicators and informative liner notes; and a compact disc, voluminously indexed for ease of practice, with two performances in digital stereo: one complete with soloist, then a second minus you, the soloist. RIMSKY-KORSAKOV : SHEHERAZADE FOR GUITAR, ARRANGED BY Larry Coryell. SHEET MUSIC BOOK WITH STANDARD NOTATION AND GUITAR TABLATURE. SPARTITI PER CHITARRA CON : PENTAGRAMMA E TABLATURE. 1ST MOV. - I THE SEA AND SINDBAD'S SHIP. 2ND MOV. - II THE STORY OF THE CALENDER PRINCE. 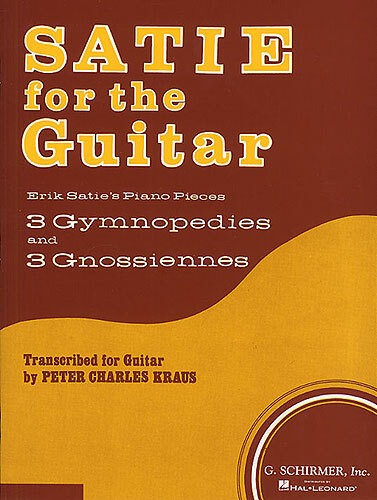 SATIE FOR GUITAR. Trascrizioni per chitarra classica di 3 Gymnopedies e 3 Gnossiennes, del compositore francese. Alfred Erik Leslie-Satie nacque a Honfleur nel 1866. Studiò in vari conservatori, ma il suo spirito ribelle non si adeguò alle regole tradizionali; (invece della frase che tempo fa' andava di moda alla televisione e tra la gente: "Non capisco ma mi adeguo"; Satie si sarebbe probabilmente espresso: "Capisco e non mi adeguo"). Le "3 Gymnopedie" sono del 1888, e il nome deriva da una danza dell'antica Grecia; mentre il termine delle "3 Gnossiennes" del 1890, è riferibile a Knossos, l'antica città dell'isola di Creta, ov'era situato il mitico labirinto del minotauro. Questi pezzi per piano fanno parte del primo periodo compositivo; senza divisioni di battute, basati su accordi complessi, di settime, none, undicesime. Terminata questa fase, il musicista oramai trentenne, si interessa alla musica dei café-concert; suona il piano nei cabarets, e diventa amico degli artisti bohemiens di Montmartre. In perenne contrasto con l'accademismo e l'impressionismo musicale di Debussy, Eric Satie combatterà la musica "dotta" a colpi di "musica da tappezzeria" e la sua trama musicale affine a un collage cubista, attirò l'attenzione di Picasso, Diaghilev, Cocteau, Picabia, diventando così il loro animatore. Con il gruppo dei 6, diede vita a rivoluzionari spettacoli e balletti. Liberatosi delle provocazioni e abbandonate le polemiche, l'opera nella quale Satie esprime la propria poetica è "Socrate" del 1918. Il neoclassicismo di Stravinsky risentirà poi delle sue sonorità. Satie morì a Parigi nel 1925 povero ma celebre. 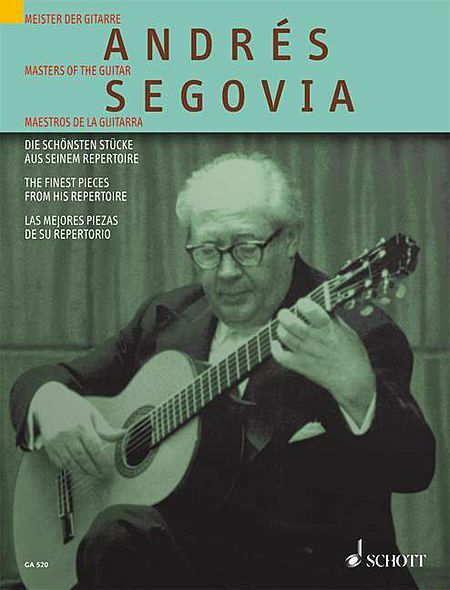 SEGOVIA ANDRES, THE FINEST PIECES FROM HIS REPERTOIRE. La frescobalda -Bach, chaconne -Segovia, estudio -Chopin, mazurka, e molti altri pezzi. Contents: Aria con Variazioni from La Frescobalda (Frescobaldi) - Chaconne (Bach) - Gavotte (Bach) - Passacaglia (Couperin) - Sonata from 8 Aylesforder Pieces (Händel) - Sonata (D. Scarlatti) - Sonatine (Benda) - Cantabile (Vanhall) - Minuetto (Vanhall) - Variations on Das Klinget so herrlich from The Magic Flute (Sor) - Bittendes Kind (Schumann) - Fürchtenmachen from Kinderszene, Op. 15 (Schumann) - Waltz, Op. 39, No. 8 (Brahms) - Mazurka, Op. 63, No. 3 (Chopin) - Tango, Op. 165, No. 2 (Albéniz) - Sonata meridional (Ponce) - Thème varié et Finale (Ponce) - Tres Canciones Populares Mexicanas (Ponce) - Hommaga à Tarrega (Turina) - Fandanguillo (Turina) - Serenata burlesca (Torroba) - Suite castellana (Torroba) - Mazurka (Tansman) - Estudios (Segovia) - Estudios sin luz (Segovia) - Tonadilla auf den Namen Andrés Segovia, Op. 170, No. 5 (Castelnuovo-Tedesco). 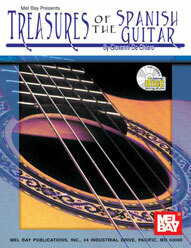 TREASURES OF THE SPANISH GUITAR. Capricho arabo, e altri 10 brani di Aguado, F. Tarrega, G. Sanz, L. Narvaez. CD TAB. ATKINS CHET, CONTEMPORARY STYLES. Includes duets with Dire Straits' Mark Knopfler. Con anche la parte della chitarra di Mark Knopfler in "cosmic square dance " e in "imagine". TAB. Chet Atkins is one of guitar's living legends. In this book you will find the best of Chet's contemporary recordings completely transcribed in both tablature and standard notation, including several duets with Dire Straits' Mark Knopfler. 14 songs in all, including. 104 pages. ATKINS CHET, THE BEST OF Styles and Techniques of the Father of Country Guitar. CD TAB. Learn the trademark riffs and licks behind one of the most influential recording artists of all time and one of the founders of the Nashville sound. This book/CD pack features analysis and lessons for 12 Atkins hits along with a CD featuring full demos. 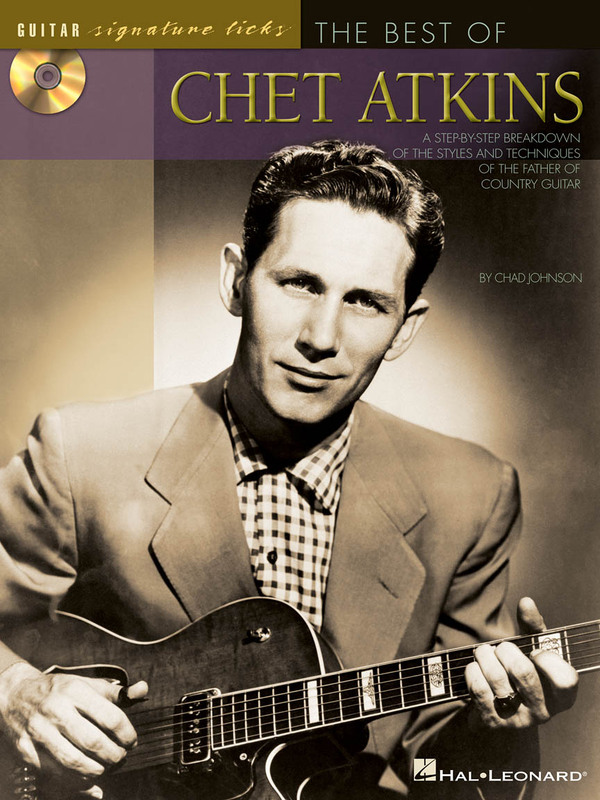 Chet Atkins holds a place in musical history reserved for a very select few. His contributions to country music are inestimable, as is his influence on guitar players worldwide. Simply put, country music would not be the same today if it weren't for Chet. Quite likely the most recorded instrumentalist in the history of popular music, his guitar playing has graced the records of Elvis Presley, The Everly Brothers, Hank Williams, Jerry Reed, and Les Paul, to name but a few. Originally a disciple of fingerstyle legend Merle Travis, Chefs groundbreaking guitar work throughout his recording career of over fifty years has in turn influenced the styles of such notable players as Mark Knopfler, Eric Johnson, and George Harrison. And although his virtuosity on the instrument is well acknowledged, his talents were not limited to the guitar alone. As a producer for RCA records, he is often credited as single-handedly creating the "Nashville Sound" as we know it today, fusing the twang of traditional country with a pop sensibility. His list of producer credits reads like a "who's who" in popular country music, including Patsy Cline, Waylon Jennings, Charley Pride, Elvis Presley, and Jerry Reed. He also discovered and/or signed such legendary artists as Dolly Parton, Ronnie Milsap, Willie Nelson, and Steve Wariner. Chester Burton Atkins was born on June 20, 1924, in Luttrell, Tennessee, about twenty miles northeast of Knoxville. His first musical influence was his older brother Jim, a highly accomplished guitar player who eventually went on to play with Les Paul. Chefs parents separated when he was ten, and he moved to Georgia to live with his father, a music teacher and song leader for several traveling evangelists. At his brother's suggestion, the fiddle became Chefs first instrument, but it wasn't long before he acquired a Sears Silvertone guitar and started learning to play it. He advanced rapidly, and by the time he left high school in 1941 at age seventeen, he had made up his mind to make a career for himself in music. Sholes was greatly impressed by Chefs playing and put him to work immediately; Chet was featured on nearly every recording session of 1949. Mother Maybelle and the Carter Sisters hired him a year later as a regular on the Grand Ole Opry, signaling that Chet had officially arrived in Nashville. During this time, Chefs playing wound up on records by Hank Williams ("Cold, Cold Heart" and "Jambalya"), The Louvin Brothers ("When I Stop Dreaming"), The Carlisles ("Too Old to Cut the Mustard" and "No Help Wanted"), Kitty Wells ("Release Me" and "Repenting"), and many more. When Sholes could not make the sessions because of other business, Chet was allowed to produce them himself. TONE POEMS II FOR GUITAR, TAYLOR MARTIN AND DAVID GRISMAN. Basame mucho -blue moon -jeepers creepers -mairzy doats -over the rainbow -mood indigo -it had to be you -please -swanee -crystal silence -out of nowhere -Musette for a Magpie. TAB. THE ORIGINAL BLUEGRASS SPECTACULAR GUITAR! 72 minuti. CD TAB.